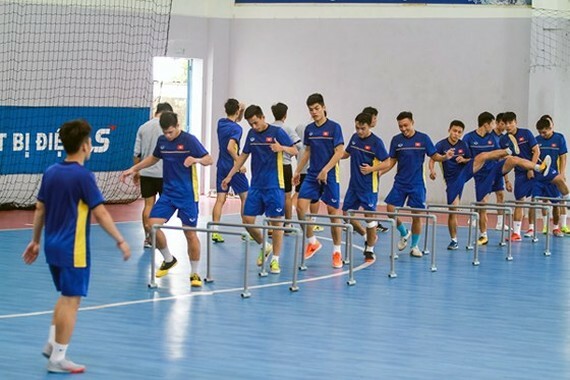 Vietnam’s National Futsal team yesterday traveled to Thailand for training course, aiming to prepare for the ongoing 2018 Southeast Asian Futsal Championship. During one week training in Thailand, the team will have two matches against Thai Port (on October 22) and D.Highway Club (on October 26). On October 27, the team will return home for the final preparation before Vietnam Futsal players will tour to Indonesia to take part in the 2018 Southeast Asian Futsal Championship which is schedule to take place from November 5 to 11. Head coach Miguel Rodrigo targets the team will enter the final round. Vietnam’s National Futsal team yesterday traveled to Thailand for training course aiming to prepare for the ongoing 2018 Southeast Asian Futsal Championship.